The colonoscopy procedure is something that many people worry about. Some people are embarrassed at the thought of having a camera put where the 'sun don't shine' and many people are just plain scared. This is all very understandable as this is not something that is an everyday occurrence and you are probably wondering "what on earth will happen to me?" This article is going to tell you what to expect, as being in the know should lessen your fears. The unknown often causes more anxiety than the known. And just to let you know I have had the colonoscopy procedure myself so I am talking from a position of 'been there, done that'. What is a Colonoscopy ? You will be asked by your doctor to undergo the colonoscopy procedure if you have certain symptoms that the doctor feels need further investigation such as abdominal pain, rectal bleeding, chronic diarrhea or constipation and other symptoms not from the bowel like anemia and unexplained weight loss. A colonoscopy is also done as a part of a routine screening program if you or a family member have a history of bowel cancer or just if you are over a certain age (usually 50 or 60 in most countries). The colonoscopy is a way for your doctor to get a close up look at the inside wall of your colon (large intestine) using an instrument called a colonoscope. This is a thin flexible telescope about the width of the pinky finger with fibre-optics that let the operator light up the inside of the bowel. It is introduced into the back passage and slowly pushed around the large bowel until it meets the junction with the small bowel. The doctor can look directly through the colonoscope but these days they usually send pictures to a screen where they are on the lookout for any abnormalities. Sometimes the doctor will do a flexible sigmoidoscopy instead which is a similar procedure but only looks at the back passage and the first part of the large intestine called the sigmoid colon. Which Position Will I be in During the Colonoscopy Procedure ? You will be asked to lie down on your side and bring your knees towards your chest. Normally the colonoscopy procedure is not painful but it can be a little uncomfortable as in order to get a better view gas is pumped into your bowel to inflate it. It will probably be a bit more uncomfortable if you are suffering from an inflammatory condition like ulcerative colitis or Crohn's disease. I did not find that it hurt at all but I was distracted by looking at the fascinating pictures on the screen! You don't have to look by the way and some doctors position the screen so that you can't see anyway. Can Biopsies be Taken During a Colonoscopy Procedure ? Yes, a classic colonoscope has a channel running along the side which allows instruments to be passed through in order to take a sample of tissue which can be sent to the lab for analysis. This also allows polyps which are benign growths to be removed. Does it Hurt When They Take a Biopsy? No, normally you will not feel the biopsy being taken. Does My Bowel Have to be Completely Clear? For the colonoscopy procedure to be of benefit your large intestine up as far as its junction with the small intestine has to be free of poop or the doctor will not be able to see the walls of the bowel. If they cannot get a clear view then they may miss things such as inflammation or polyps or growths. In order to clear the bowel of poop you will either have to take very strong laxatives or a combination of a low fiber diet and laxatives. It is very important to follow the instructions carefully because if your bowel is not cleared out then the whole colonoscopy procedure will have been a waste of time. Imagine trying to look through a windscreen covered in mud and you will get the picture. You would not be able to see the road ahead! The exact regime will vary in different clinics but in most cases you will be asked to change into a gown or other hospital type garment. I was given special paper underwear which was like a large pair of shorts with a hole in the back that was covered over with a flap. I wore these underneath a gown. This is to make you feel more comfortable and less self conscious but it also allows easy access for the doctor doing the test. The colonoscopy procedure is usually carried out in a hospital or a clinic but normally you will be an outpatient and will not have to stay overnight. People who have any underlying health problems such as heart conditions, bowel diseases etc. may have to stay longer for monitoring. They may also be attached to a drip and have their hearts monitored during the procedure. Will I Be Asleep for the Colonoscopy Procedure ? No, in most cases a sedative will be given usually via a needle in the back of the hand which will make you drowsy but you will still be awake. As you will be sleepy after the procedure you should not drive or operate machinery or drink alcohol. You should take a friend or relative with you who can take you home and stay with you until you are fully awake. How Long Does a Colonoscopy Take ? The actual procedure will take about 20-30 minutes but from beginning to end the whole time spent in the hospital will be about 2-3 hours which will include receiving explanations and signing a consent form, answering questions about your bowel prep, getting changed, being given a sedative and resting afterwards before going home. You may have to stay at the hospital a little bit longer to be observed if you have had biopsies taken and especially if you have had polyps removed to make sure that you are not bleeding from the removal site. What is the Worst Bit of the Colonoscopy Procedure ? Well for me the worst bit was the bowel preparation. I was given two doses of a very strong laxative called Picolax which by the way tastes horrible. All I can say is that it produces diarrhea like you have never seen before and abdominal cramps because it keeps fluid in the bowel and it makes the large bowel contract very strongly. My advice is stay very close to the bathroom and just keep telling yourself that it is going to make your bowel as 'clean as a whistle' so it is doing a good job! It is also important to drink plenty of clear fluids to prevent dehydration. After my bowel was cleaned out the rest of the colonoscopy procedure seemed like a breeze. In most cases you will go home and you will not notice much except you may be a little bit gassy for a few hours from the air that has been pumped into your bowel. You may pass 'wet farts' so if this happens maybe wear a pad. If you have had a biopsy you may pass a small amount of blood. You will probably not open your bowels for a little while, as remember there will not be much in there. Most people will get back to their normal lives the next day. Complications are very rare indeed but infection, bleeding and perforations are possible. If you experience a lot of bleeding, a fever or abdominal pain which is getting worse then contact your doctor immediately. See here for more information on side effects. 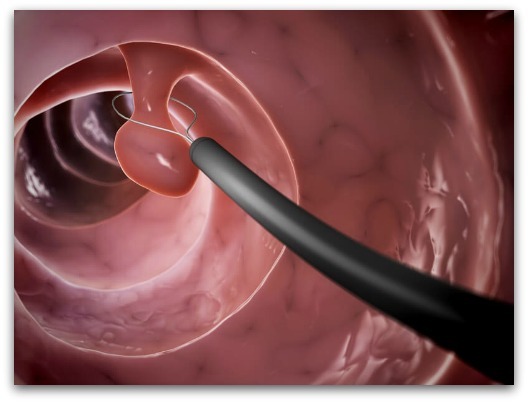 Is the Virtual Colonoscopy Procedure Different? Yes. Virtual colonoscopy means that the telescope is not put into your bowel but instead this is a type of x-ray. It involves the use of a CT scanner and so is normally carried out in the scanning department. Two and three dimensional images are taken of your bowel. 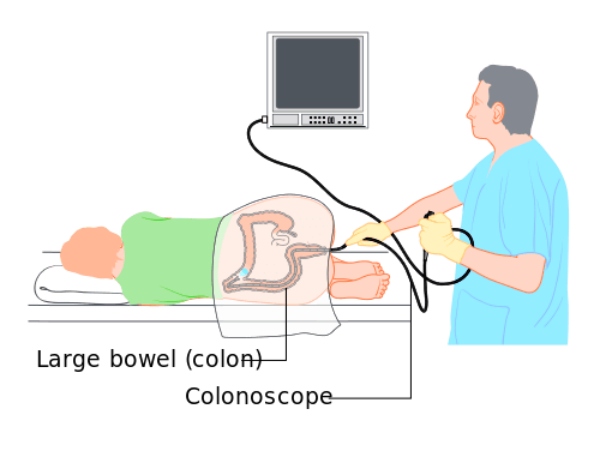 It takes about 15 minutes to do the test and you will have a small amount of gas blown into your bowel first to inflate it and then you will lie on the scanning couch in different positions like on your front, side and back while the pictures are taken with the middle of your body in the middle of the scanning tunnel. As with a more classic colonoscopy you will have to prepare the bowel first usually by eating a low residue diet which cuts down on solids and by taking a laxative. Sometimes you will be asked to take an iodine preparation with food to help your bowel show up more easily on the scan. In some cases just before the test you will be given a preparation injected into the back of the hand to help relax the muscles in the bowel and sometimes you will also be given a dye at the same time which will help give clearer pictures. Virtual colonoscopies are sometimes done if more information is needed after a normal colonoscopy has not been successful or when the patient is frail and may not be suitable for the classic colonoscopy procedure. The downside is that it cannot be done if you are pregnant and biopsies are not possible. Of course we are all hoping that the results will show that our bowel is completely normal. If your test is being done by a gastroenterologist or gut doctor then he or she may be able to tell you straight away that everything looks normal but in some cases you will have to wait a few days or a week for biopsy results to come through. Sometimes your colonoscopy procedure may be carried out by an expert technician (especially if you are having a virtual colonoscopy) who will then give the pictures to a doctor to be reported on. This means it can take several days or even weeks for the report to be written and to filter through. This waiting time can be very stressful especially if you have worrying symptoms. If something is found then tell yourself that you have done the right thing by having the colonoscopy procedure done as the earlier any abnormality is found the more likely it is that you will have a good outcome. For example about 25% of people who undergo colonoscopy after the age of 50 are found to have polyps. These are not cancerous but they can later develop into cancer and so if they are removed during the colonoscopy procedure then you are protected from developing cancer in the future. Yes, having a colonoscopy is not something most of us would wish to have on our bucket list but maybe it should be because having a good look inside the bowel especially after the age of 50 could help give us more time to actually get all those things on our bucket list ticked off! Find all the tips you need to make sure your colonoscopy goes smoothly. Check how often side effects occur after a colonoscopy and find out what to look out for and when to call the doctor.